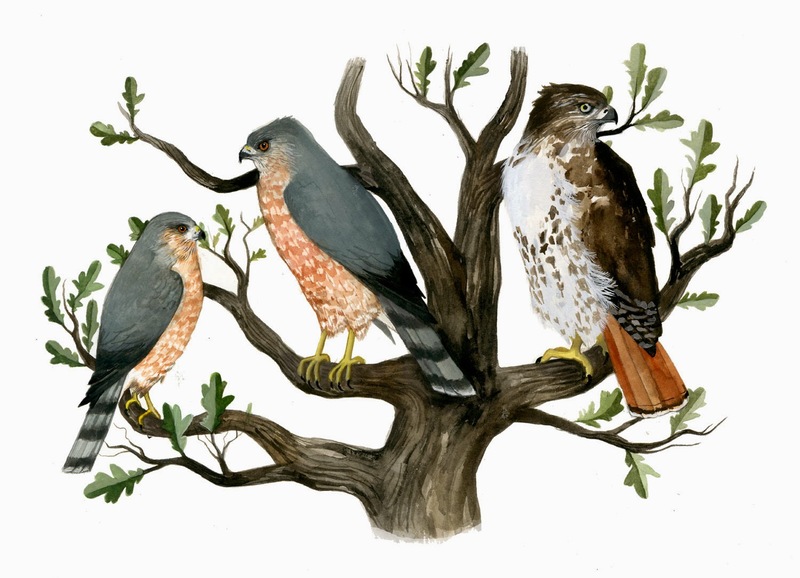 At roughly the size of an American Robin, Kestrels are our smallest falcons in the States. Falcons have evolved to be adept at bursts of high speed, diving, and twisting maneuvers (as demonstrated by Peregrines to an astounding degree) when pursuing prey. Kestrels exhibit sexual dimorphism in that the females are larger in size than the male. Plumage varies between the two as well: the male having a fair amount of blue-grey on the wings and head, and the female lacking it on the wings. I have seen them in the countryside as well as urban areas. There is a Kestrel that I occassionally watch that hangs out near Ravenswood and Montrose and forages along the grassy area lining the Metra tracks. It usually perches on a lamp post, and will spontaneiously dive bomb prey. 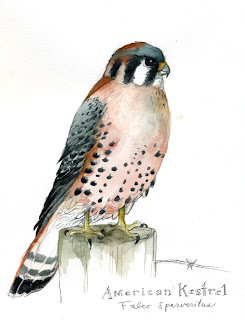 The patterning and color on Kestrels is so elegant, that they are ready-made for watercolor. Your artwork is incredibly inspiring and beautiful.